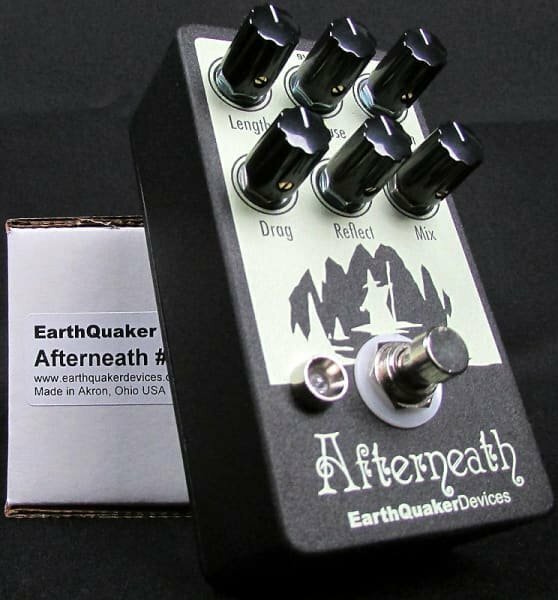 The Afterneath is an otherworldly reverberation machine that uses a swarm of short delays to create wild and cavernous reverbs and scattered, short rhythmic delays with bizarre characteristics. The reverb created is beyond massive and goes well beyond the territory of most reverb pedals. The controls allow you to stretch, smudge, swell and even self-oscillate into messy ambient washes of sound. The Length control adjusts the decay of the reverb; anything from shorter hall through endless plate style reverbs can be achieved. The Reflect knob controls the regeneration, basically feeding the output back through to create an even deeper otherworldly dreamscape. The Drag control lets you pull the reverb through time by slowing down or speeding up the reverb. The Diffuse knob adds control over spread of the reverb ranging from identifiable attack to a wash of smooth reverb. The Dampen control adjusts the tone of the reverb, both stinging bright tones and warmer swell. The end result is an ethereal, ambient wash that goes from hall to an infinite glitched-out orchestra pit warming up in a canyon at the bottom of another canyon inside a well. The Afterneath is true bypass with an all digital reverb engine, all analog dry signal path and hand made one at a time by real living human beans in dimly lit Akron, Ohio.